There are three main debt purchases that can derail our finances if we are not careful. The first two are seemingly necessary, and the last is a result of overall poor money management. A few years ago, I had a young man who had just graduated from high school ask me how much I thought he should spend on his first car – I was immediately impressed by his maturity in asking this question. He seemed to know that this decision would have more of an impact on his future than just how much the monthly payment was going to cost him. Knowing that he didn’t have kids to transport I told him to find the most reliable car he could for around $500, and to pay cash for it. I understood this advice was unpopular. Asking someone to make this kind of decision is like asking someone to swim upstream. Our society has trained us to believe that our cars are a status symbol. It somehow tells others that we drive past that we are successful – or not – by the car we drive. For this reason, it is very hard for most people to buy something that doesn’t reflect how they want others to perceive them – makes them feel like they are swimming against the current of society when they choose not to conform. I wanted this young man to know that he was at a crossroads. He could start his adulthood off by making prudent decisions, or he could get caught in the debt trap that engulfs so many. I especially felt like this was a valuable lesson for an 18-year-old to learn. It’s much easier to avoid that trap than try to change habits later on. It can take years to dig out from a poor financial decision. Unfortunately for many this trap extends beyond early-adulthood. Recent statistics have estimated that 85% of new car purchases are done through financing. This statistic should give you pause next time you are driving down the road. At least half of the cars you see have a loan on them – and a much higher percent if they are newer. Not only are these cars being financed, but individuals are maxing themselves out to do so. The average car payment ranges between $350-$550 per month. To me that number represents more than just a payment – it represents a missed opportunity. How often do you hear someone talk about how happy their car makes them? I’m sure there are many who do, but not most people. What I most often hear from people who have spent excessively on cars is regret – and specifically the opportunities they missed with their kids because of not having the money. So, if what we really want is to create memories, why do we spend so much of our monthly income on cars? For someone who makes $60,000 a year, that car payment can represent over 10% of their take-home-pay. When we put money towards one item, it automatically takes away from something else – hence the missed opportunity I referred to earlier. If we take inventory and truly evaluate what we are foregoing for these loans, I wonder how many people would make different decisions. Would we purchase differently if we only paid cash? Absolutely! That alone would help us control how much we spend. Suddenly we would find many cars that would fit our needs for much less money. It’s interesting how that works. When I was young, I did a paper route for longer than I would like to admit. The purpose of this paper route was to help me earn money for my first car. Every morning I would get up around 5 o’clock to deliver newspapers. For a young kid that represented a great sacrifice – it wasn’t easy. Finally, when I was 17 years old I had the money to buy a 1990 GMC Jimmy. A few short years later I was then determined to buy a Jeep Cherokee. I went from having a paid off car to a new car loan – to this day I still regret that decision. At the time I was making less than $10 an hour and was a full-time student in college. I am not sure why I thought this was a good idea, but I did. The Jeep I purchased was still less than $10,000, but that was still $10,000 more than I owed on my paid-off Jimmy. Overall it was a poor decision. I still have that Jeep and often think about how it represents a decision I should not have made. I always get a kick out of people working so hard just to afford that car that helps them drive to work. What I am aiming for is building true wealth. That is hard to do if you are putting your money into a depreciating asset, like a car. This is especially true if the payment is high relative to your income. It is because of this experience I told this young man to buy the least expensive car he could find. I realized at a young age how valuable it is to not have a car payment. I am not saying having a nice car isn’t okay. I am simply saying the cost must be evaluated. If your auto loan is hurting your finances to the point you are not able to save, invest, and take trips with your family; then it’s time to make a change. There is no doubt as my finances grow so will how nice of a car I drive – especially because I don’t believe in living a life of scarcity. As a simple gauge, if your auto loan is hindering other areas of financial growth, your payment is too high. There is no shame in downgrading to a less expensive car so you can grow your wealth – in fact it only makes sense. Because a home is not liquid – meaning you can’t sell it easily, and without a large cost – it has the power to greatly hurt your finances. It is not a purchase you can undo easily. Back in 2008 many households speculated that home values would continue to go up. They even took on risky loans thinking they could just sell or refinance before the risky loan features kicked in. The problem, home values do not always go up. Once they started to drop there was no way to refinance and these borrowers were stuck – eventually leading to default on their loans. The next wave of defaults we are likely to see probably won’t result from bad loan products. It will have a different look but will be just as disastrous. The next defaults will likely be caused by over-extension of credit – with auto loans, mortgages, and credit cards being the main culprits. It is becoming much more expensive nationally to live. Renting isn’t much better – in many places it may even cost more. There is a big difference in cost however when looking at renting and owning. When you own a home, you are responsible for many expenses that would otherwise be someone else’s problem. The Federal Housing Authority – the sponsor for the FHA program – stated that one of the main causes of default in their loan program comes from an unexpected home repair – specifically a furnace. When you are house poor – meaning your house payment is so high that it eats up what extra monthly income you have – it makes it almost impossible to cover unknown expenses. It makes me feel bad to know that not only do some families have a cold home because of not being able to fix the furnace, but also that they may lose their home because of that expense. Housing should be between 25%-30% of your net income. When this number reaches closer to 40-45%, there is very little room for error. Because home prices have risen so quickly over the last few years, when we see a slow-down in our economy many households will inevitably feel the squeeze. Add on top of this that most people do not have an emergency fund. Like cars, we are trained to believe that owning a fancy home is necessary. The truth is, when done at the wrong time it can cause more harm than good. I personally believe there is a lot of good that comes from owning a home. It gives your family stability and continuity. That being said, there is a true cost that must be weighed. Buying a home is something one must prepare for. Making sure your credit score is excellent and you have a good down payment – at least 10% in my opinion – can save you a great deal of money each month. Where homeownership goes wrong is when it causes you to miss other opportunities or neglect your financial future. Be cautious with the amount of home you buy. When you max out what a bank will lend you it is a sure sign you are on the road to being house poor. When this happens, your financial progress will come to a screaming halt. Use the rental market as a gauge for how much home you should buy. If your income his higher use the 25-30% range to help prevent yourself form over-extending. By definition credit cards are a stop-gap. A stop-gap is something that is used to either delay dealing with an issue or used to satisfy a need. When there are deficiencies in how much we make and spend, the credit card is what we use to fill that gap. 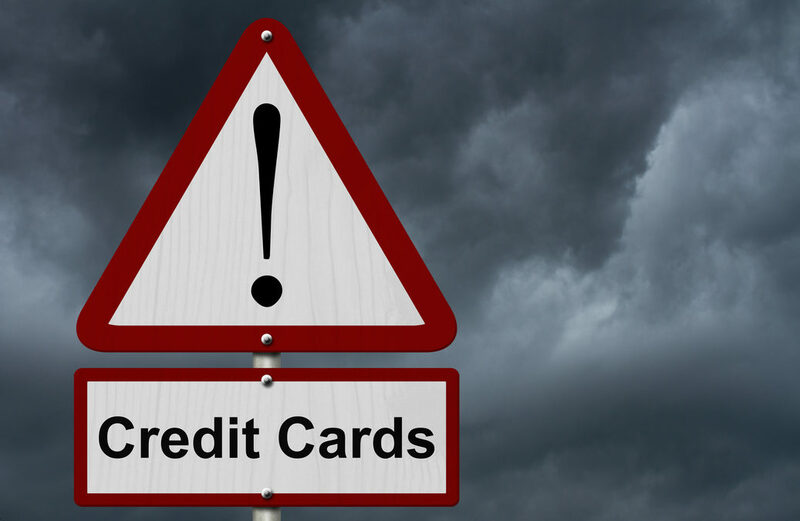 Credit cards are especially harmful because they prevent us from fixing problems. Imagine how differently people would deal with their finances if there wasn’t a credit card to bail them out. That would require us to review our spending and make decisions much sooner. If you want to force yourself to make change, take away the safety net – credit cards, lines of credit, etc. Throw them away. This would require you to nail down what your wants and needs really are – and makes decisions accordingly. It is estimated that the average household in the US has just over $15,000 in credit card debt. Depending on your interest rate that payment could be north of $300 per month. Once again this represents a missed opportunity. With that same $300 per month – or $3,600 per year – most families could enjoy a meaningful vacation. If invested monthly over a 30-year period, this same amount of money could turn in to $370,000. This really puts into perspective what spending on credit is costing you. The $300 a month is nothing compared to the lost $370,000. Many individuals will carry credit card debt for 30 years – if not the rest of their lives. What you will likely find when doing your spending reviews is that a lot of that $15,000 credit card debt is made up of unimportant items – wasteful spending that is not adding value to your life. They have almost become an expectation in our society. It is concerning how casually they are used and acquired. A good first step would be to get rid of your credit cards. Having that safety net removed will require automatic discipline that will force you to live within your means. These three debt traps are the most common areas people get themselves into trouble when it comes to spending. They are especially dangerous because when we max ourselves out on these debts, there is no money left over to help improve our situation. You are essentially stuck. The over spending on homes and cars puts pressure on our credit cards as it picks up the slack for these excessive purchases. These financial decisions will be felt for many years as it is not easy to undo these decisions. Take a careful look at what your goals are. Then look at your finances to see if they are helping or hurting your progress. Are they preventing you from traveling, starting a business, having less stress, etc.? If they are limiting what you are able to do, make a change. You have to determine if those debts are really worth the missed opportunities. I would argue you can have both – but not if done in the wrong order. If you get your finances in order now, you will be able to enjoy many experiences and “nice things” throughout life. Develop a mindset of paying cash as it will help you purchase within your means and stay out of debt – leaving money for what really matters. If you already have debt, tackle it with determination so you can start living the life you truly desire!